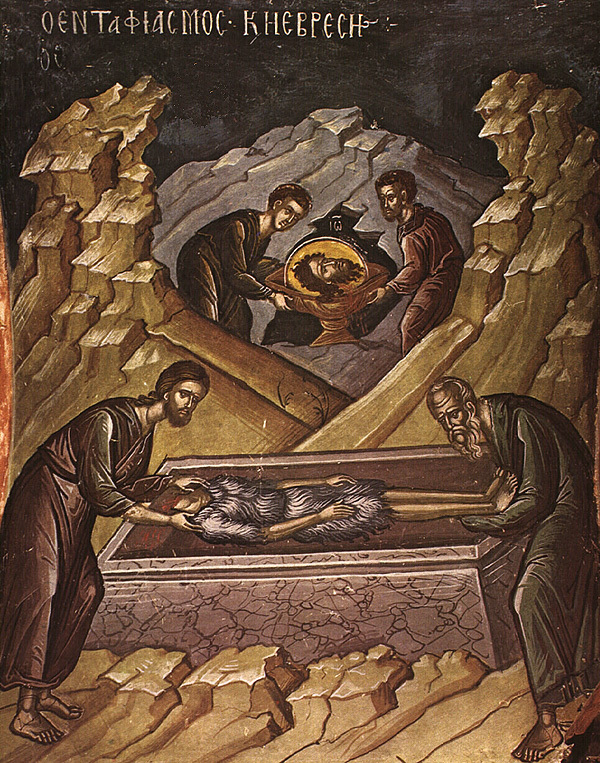 The honorable head of John the Forerunner, which excites reverence from the Angels, was first buried in the house of Herod, who had imprisoned him and decapitated him on account of Herodias, the wife of his brother Philip, since John had rebuked Herod for his illicit relationship with his brother's wife. 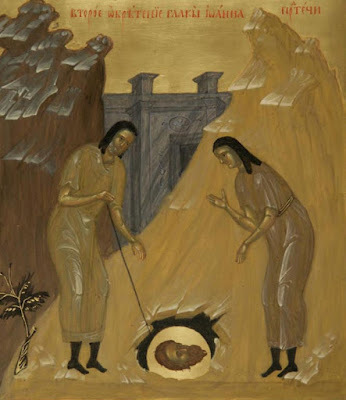 When the disciples of John buried his body in Sebaste, Herodias kept his head to mock it and secretly buried it on the grounds of the palace in an unclean place. By this she wished to keep the head separated from the body, in order to prevent his possible resurrection and further rebuke. One of the women of her household was Joanna, the wife of Herod's steward, who also was a follower of the Lord Jesus and was among the myrrhbearers. Distressed over the mistreatment of the honorable head of the Forerunner, she became privy to the hiding place where the head of the Forerunner was buried, so she secretly retrieved it one night and took it to the Mount of Olives, and buried it on the grounds there of one of Herod's estates. Shortly before Constantine the Great ascended the throne of the Roman Empire in 324, a certain Christian named Innocent resolved to forsake the world and live an ascetic life on the Mount of Olives, where he purchased some land on property that formerly belonged to Herod. There he built a cell and a chapel to pray in. During construction, a trench was needed for the foundation, and while excavating he discovered an earthenware vessel containing a skull. The identity of this skull he learned by divine revelation, accompanied by works of power and grace, having performed many miracles. Before the repose of the monk Innocent, he reburied the honorable skull on the grounds of his cell and chapel. Over a number of years, this site fell into ruin and the location of this precious relic became unknown. 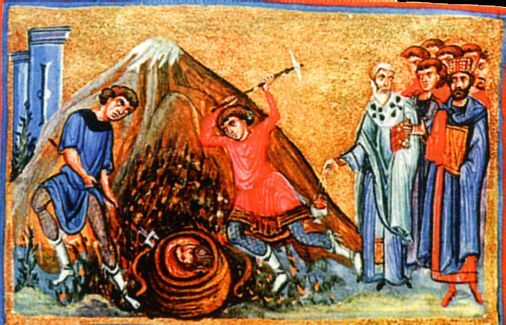 After Constantine came to the throne, and his mother Helen made the Holy Land a center of pilgrimage with the discovery of the True Cross and the Holy Sepulcher, among other places, two Monks decided to make a pilgrimage to Jerusalem to venerate the Holy Places. One night while the monks were sleeping in Jerusalem, one of them was granted a visitation from Saint John the Forerunner. 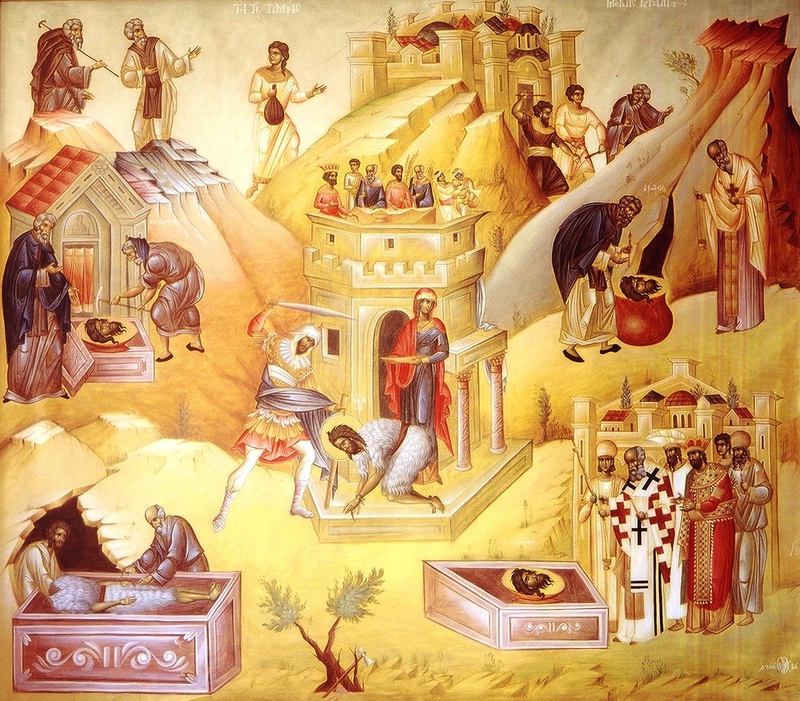 He revealed to the Monk the exact location of his head on the Mount of Olives, and commanded him to find it. When he awoke and told his fellow Monk about this divine revelation, he convinced him that it was nothing but a mere dream and they ignored it. The next night, however, the Forerunner appeared to both Monks separately and rebuked them for their disbelief, commanding them to rise and do what he commanded. Stirred from sleep, they went to the location indicated to them and began to dig. Before long, they discovered the earthenware vessel with the skull. Placing it in a sack made of camel's hair, they returned to Jerusalem. During this time there was a potter living in Emesa (Homs) of Syria, who had fallen into poverty and was looking for another form of occupation. Leaving his wife and home, he went to look for work, and on the road encountered the two Monks who had now left Jerusalem to return to their homeland with the honorable skull. Seeking companionship in his travels, the potter followed the Monks and carried the sack which contained the skull of the Forerunner after he was asked to, though it was not divulged to him what was in the sack. As they walked and the Monks became a little separated from the potter, the Holy Forerunner appeared to the potter on the road, and said to him, "Know that I am John, the Lord's Forerunner. The sack, the one that you bear in your hand, contains my head. I bid you to flee the company of your fellow travelers." After confirming that the sack contained a skull, the potter obeyed without hesitation and returned to his home and wife in Emesa. 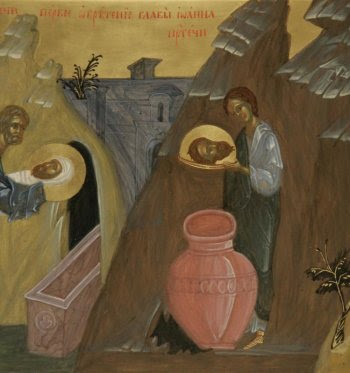 As for the reason why the Holy Forerunner bid the potter to take the relic from the Monks, it has been suggested that it was because these Monks were too negligent and unbelieving to properly care for the precious skull. This was shown by the fact that they gave the sack to a stranger to carry, when they should have kept it and guarded it with their lives. The potter, however, submitted to the Monks and carried the sack with care. It has also been suggested that these Monks may have belonged to a heretical sect. The potter returned to his home and told his wife about everything that took place along the road. They both understood that the most precious of treasures was in their home, so they daily burned incense and lit a lamp before it. For this the Forerunner blessed their home, and their poverty became a faint memory. However, they were not overcome with pride, but made sure to properly distribute their wealth to the poor and needy, understanding that they were blessed by God through the Forerunner. 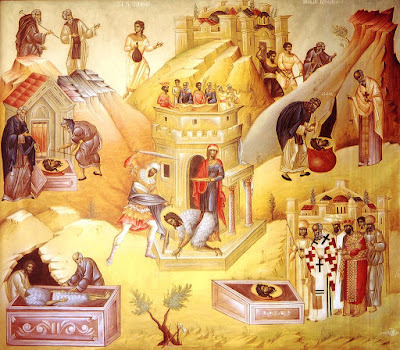 At length his wife of many years reposed in the Lord, and as his own end drew near, the Holy Forerunner appeared to him and said, "The time of the end of your earthly sojourn is at hand. Place my head in an empty water vessel. Seal the jug and entrust it to your sister. I do not wish for my head to be enshrined in gold or silver reliquaries." The devout potter obeyed and gave the sealed jug to his sister, bidding her not to open it unless the Forerunner willed for her to do so. After the potter reposed, his sister faithfully kept the precious treasure in her home. And when she reposed she handed it over to another devout and virtuous Christian. Over time, the precious relic passed from one devout Christian to another. 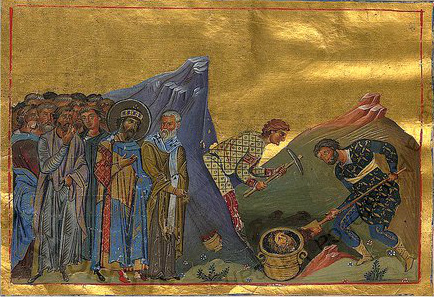 At one point, the honorable head came into the possession of an Arian hieromonk named Eustathios, who lived in a cave. The holy relic was responsible for numerous wonders and miracles and healings, however the heretic Eustathios ascribed these to himself rather than the Holy Forerunner, in order to promote his godless heresy. By this many people were lured into believing that Arianism was true and accepted the heresy. Over time however, the people of Emesa came to understand the evil intentions of Eustathios, and they sought to drive him out of his cave. When the officers were informed they went to have him removed, but Eustathios convinced them to wait for a few hours until he got his things in order and then he would leave. During this time he took the jug which contained the skull and buried it in a deep hole in his cave. His intention was to return at some point and retrieve the relic, which brought him such prestige and fame, in order to continue his fraud. However, with the departure of Eustathios, certain Orthodox monks took up their habitation in this cave, and Eustathios was unable to retrieve the relic. As time passed, the site of the cave of the heretic Eustathios became the site of a growing brotherhood of monks. However, no one was aware of the precious treasure contained within the cave. In the middle of the fifth century, Archimandrite Markellos, who was the superior of this community, during the time that Uranios was Bishop of Emesa, was granted a vision of the Holy Forerunner. 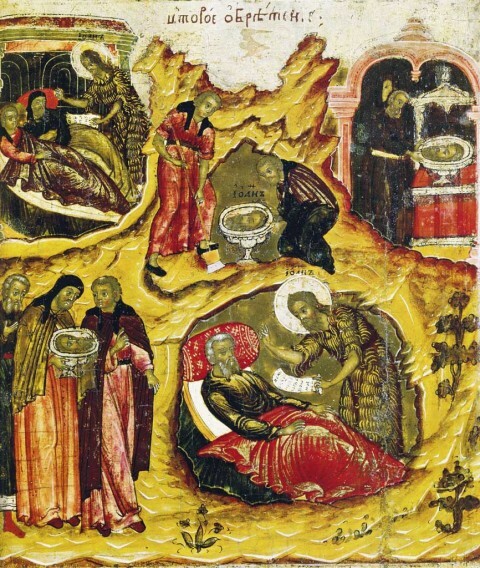 According to the account of Markellos, which has been preserved, we learn that on February 18th, during the Great Fast, the Holy Forerunner first appeared to him in a vision and blessed him. Then on February 24th the location of the skull of the Forerunner was revealed to him in another vision of a star which he was told to follow and which led him into the cave. Where the star disappeared he began to dig on that spot, and there he found the water jug which contained the holy relic. He then reverently took the honorable skull as a priceless treasure, and brought it to the Bishop, who rejoiced upon learning of this discovery. Soon a church was built in Emesa to honor Saint John the Forerunner. Inside this church a crypt was built, and the honorable head was placed therein, where it was venerated by the faithful, and became responsible for many being healed of illnesses and diseases. Since we have obtained thy head as a most sacred rose from out of the earth, O Forerunner of grace divine, we receive sure healing in every hour, O Prophet of God the Lord; for again, now as formerly, thou preachest repentance unto all the world.